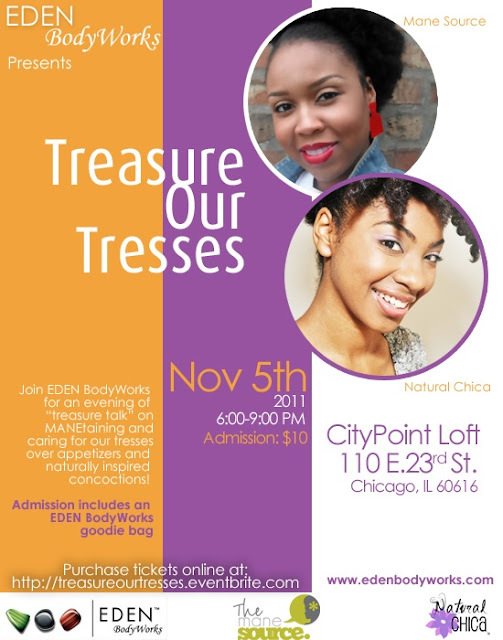 The event will take place November 5th and feature an evening of hair education, EDEN BodyWorks products, appetizers, and the opportunity to mingle with blogging favs The Mane Source and Natural Chica. Tickets are $10 (click here to purchase) and include an EDEN BodyWorks gift bag. For any ladies looking to win some tickets to this event, Chicago Beauty Blogger "The Sassy Peach" is giving away 2 tickets on her blog! The contest is open through 10/28, so click here for your chance to win.